Make sure everyone is on the same page. Your employees should know what is expected of them on a daily, monthly, and yearly basis. They should also have a solid understanding of what their co-workers are up to each day. When people are unsure of the roles that other team members fill, it can lead to miscommunication. When you’re making a new hire, your veteran employees should understand this person’s role, as well as their short and long-term goals. Create goals for the whole team. While it’s great to give individual employees goals to work towards, you also want to make sure that everyone is working together towards larger goals in order to promote a real sense of co-operation within the office. When people get too focused on their own tasks and accomplishments, it can create a cutthroat nature. However when everyone in your office is working together to achieve success, you’ll see a real sense of workplace camaraderie develop. Get to know each other outside of the office. While office happy hours may seem frivolous, they’re actually highly valuable when you’re looking to improve the sense of unity that exists within your company. It’s hard to keep employees working as a cohesive unit when they don’t know their co-workers well. However when they begin to see these individuals as friends, it’s likely that they’ll become more invested in the work they’re doing, as well as the people with whom they’re doing it. Put employees in roles where they’ll shine. Don’t pigeon hole your employees if you want to reduce turnover. If someone has a passion for video editing, let them find a way to use this skill to help the company, even if it’s not technically in their job description. When employees are allowed to explore their strengths and work together to develop new initiatives within the office, they’ll feel much more engaged. 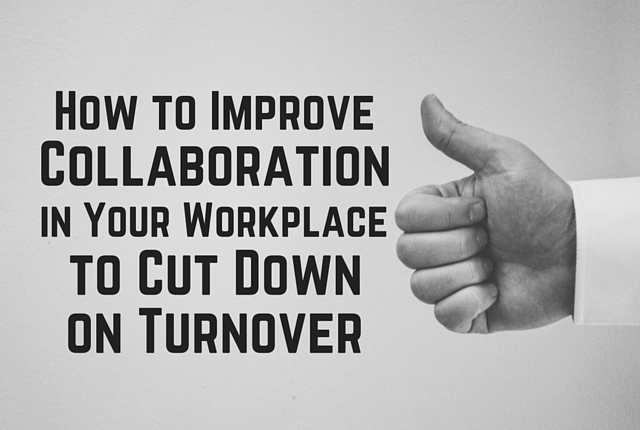 How do you foster a collaborative environment within your workplace? Share with us in the comments!